HIROSHIMA, Japan — Hiroshima's appeal of "never again" on the 72nd anniversary Sunday of the world's first atomic bomb attack has gained urgency as North Korea accelerates work on its nuclear weapons program, showing its growing prowess with increasingly frequent missile launches. When the U.S. dropped the bomb on Aug. 6, 1945, Toshiki Fujimori's mother was carrying him, then just a year old, piggyback to the hospital. The impact of the explosion threw them both to the ground, nearly killing him. "Obviously tensions are growing as North Korea has been pushing ahead with nuclear tests and development," said Fujimori. "Nuclear weapons just are unacceptable for mankind." Many Japanese and others in the region seem resigned to North Korea's apparent newfound capacity to launch missiles capable of reaching much of the continental United States. But the threat lends a deeper sense of alarm in Hiroshima, where 140,000 died in that first A-bomb attack, which was followed on Aug. 9, 1945, by another that killed more than 70,000 people in Nagasaki. "This hell is not a thing of the past," Hiroshima Mayor Kazumi Matsui said in his peace declaration at Sunday's ceremony. "As long as nuclear weapons exist and policymakers threaten their use, their horror could leap into our present at any moment. You could find yourself suffering their cruelty." Today, a single bomb can cause even greater damage than the bombs dropped 72 years ago, he said. "Humankind must never commit such an act," he said, urging nuclear states, as well as Japan, to join the nuclear weapons ban treaty adopted by the United Nations in July. Fujimori said that each Aug. 6, his late mother, who also survived, insisted on retelling the story of the attack to children in their neighborhood, saying she had to keep reminding them to help prevent the same mistake from happening again. Decades later, 73-year-old Fujimori himself is a leader of Hidankyo, a major organization of atomic bomb survivors. "We must eradicate nuclear weapons from the earth to make the world a safe place to live," he said in an interview. "There is still a lot to do and we must keep working on it." He said the adoption of the U.N. nuclear weapons ban, which was boycotted by all nuclear-armed nations, shows that most of the world supports that cause. Two recent test-firings of Hwasong-14 intercontinental ballistic missiles suggest that major U.S. cities such as Los Angeles and Chicago are within range of North Korean weapons. Such missiles could be armed with nuclear, biological or chemical warheads, although many experts say North Korea hasn't fully mastered miniaturizing nuclear warheads and might not have the technology to ensure a warhead would survive re-entry into the atmosphere from space or even hit an intended target. Such developments draw mixed feelings from Kim Ji Nho, a pro-Pyongyang ethnic Korean who was born in Hiroshima. Kim, 71, is a "hibakusha," or atomic-bomb survivor, who was exposed to radiation when his mother, pregnant with him, went to the ruins of the city to search for a daughter who went missing in the blast. He grew up in a community of ethnic Koreans in the city and has a relative who had since moved to North Korea. He is critical of the U.S., and says only dialogue, not military actions or threats, can resolve tensions with the erratic leadership in Pyongyang. But regarding nuclear weapons, "We 'hibakusha' and our groups share a clear goal, which is to abolish nuclear weapons from the world," Kim said. "Nuclear weapons should never be used." Like his father, many Koreans were brought to Hiroshima, a wartime military hub, as forced laborers during Japan's colonization of the Korean Peninsula in the first half of the 20th century. They and their descendants have endured outright discrimination by Japanese. So have A-bomb survivors: Kim's father had told him to keep mum about his radiation exposure, because being "hibakusha" could only mean more trouble. The two survivors said Japan's refusal to join the U.N. nuclear treaty, apparently because it's protected under the U.S. nuclear umbrella, was heartbreaking. In his message to Hiroshima, U.N. Secretary-General Antonio Guterres said the presence of some 15,000 nuclear weapons along with "dangerous rhetoric regarding their use" has exacerbated these threats. "Yet our dream of a world free of nuclear weapons remains far from reality," he said. "The states possessing nuclear weapons have a special responsibility to undertake concrete and irreversible steps in nuclear disarmament." Hopes that the U.S. and Japan might support the nuclear weapons ban rose during former President Barack Obama's 2016 visit to Hiroshima. But such expectation has dimmed as North Korea's threat has escalated. "What if that young leader (Kim Jong Un) pushes a nuclear weapons launch button? I think neighboring Japan has a risk of being hit," said Tamio Ishida, 59, whose father was a survivor. 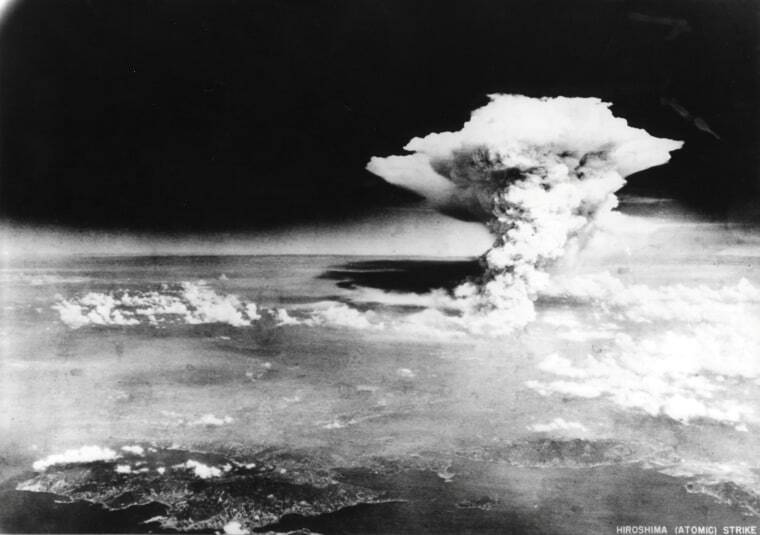 "I think tensions have risen and many people in Hiroshima share a sense of urgency." Ayaka Kajihara, 18, a college student, says she imagined her late grandmother, also a "hibakusha," suffered greatly, though she was reluctant to discuss her past. Even so, she feels it was very important to learn what happened to the grandmother and her hometown 72 years ago. More than 300,000 of the "hibakusha" have died since the attack, including 5,530 in the past year. The average age of the survivors is more than 81 years. Many suffer from long lasting effects of radiation. "I hope more people from the rest of Japan and overseas will visit Hiroshima and just see and feel the reality of what the atomic bomb has done, and start from there," she said. "Because that's how I started thinking about peace — by meeting 'hibakusha,' including my grandmother and hearing their stories."